Public domain bird image of a caged bird in a tree. 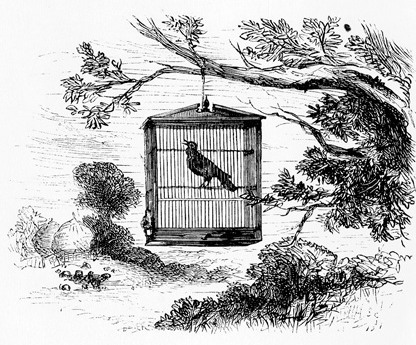 A black bird whistles for company after his owner hung his cage out for the day. A Book of Emblems with Interpretations Thereof was written by Alfred Gatty (1809-1873) and published in 1872. This may be a stock or original image used by Bell and Daldy publishers of London.